I tend to be a late adopter of popular TV shows due to a lack of time and a general unwillingness to chance my limited free time on something I might not like. Especially since my fatal flaw is that I tend to stick with a show longer than I should, mainly due to fooling myself into the idea that the show might turn around– my friend said it was good! Listen, shows like Arrow have their place but I should have bailed after the main character’s 2,000th pull-up sequence. Mr. Robot was on my list of shows recommended endlessly by friends but never quite found itself at the top of my lineup. That is until I saw a press release that an app, a work of interactive fiction, was being launched as a promotion for the show. That kind of stuff is EXACTLY up my alley, having recently done a somewhat similar thing with Juliet_Bot. I started and soon finished Season 1, wanting to get through the show before messing around with the app in case it contained any spoilers (it doesn’t really, some indirect stuff but nothing big). Mr. Robot, the show, is about a group of hackers taking on a mega-corporation, the perils of runaway capitalism, and how much modern society voluntarily places itself online. The show is ok. Instead of a strong story it leans too heavily on plot twists and a hope that you find Christian Slater charming. That said, the lead actor, Rami Malek, is outstanding and his performance coupled with my desire to investigate the app kept me around even as my attention to the show’s plot started to wander. The app, titled Mr. Robot:1.51exfiltrati0n.ipa (I’ll shorten to Exfiltration.ipa) emulates a proprietary messaging app akin to Facebook Messenger and all your interactions live within the app. This app of an app (uh-oh) does a similar thing to Lifeline, a piece of interactive fiction I’ve written about before. 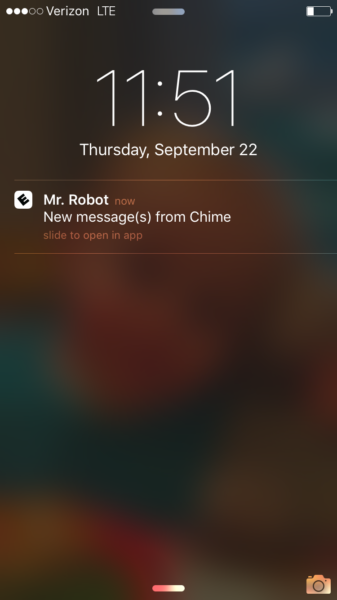 It uses your phone’s notification system to alert you to new story bits, interacted with and told by messages from “people” in the app. The idea being that the story is spread out over real time, interrupting your daily routine, in theory getting you to engage with it while you’re at work, out grocery shopping, etc. Exfiltration.ipa‘s conceit of how you get involved in this story is quickly summarized as: a) hacker accidentally drops phone with valuable file b) you pick up what you think is essentially free hardware c) you get mixed up in hacker shenanigans which you could easily extract yourself from by chucking the phone in the trash, but then where is the story in that? The Mr. Robot TV show thankfully rarely contains full “hacking” shots where a character worriedly stares at a computer screen with a progress bar filling up, but prefers to instead present computer crime as relying on what it refers to as “social engineering”. The idea being that modern computer systems are generally too tough to crack but the humans who manage those systems are flawed and exploitable. The app follows suit in that you’re never doing any hacking because it of course would be silly to infer that such a thing is possible from your off-the-shelf phone. Instead you’re texting with key characters, getting instructions from handlers, and hopefully tricking targets via texts into helping the launch of a grander scheme. Exfiltration.ipa starts off well with general conversation that is good at giving you a range of dialogue choices. It was rare that I felt forced into giving an answer I didn’t agree with. Although often the options were too chummy with my hacker handlers a little too early in the story. Oh, sure you just started texting me on this phone I picked up from the sidewalk but I’ll jump right into this illegal stuff you’re asking me to do, “lol, smiley face emoticon”. That said, those varied dialogue responses turned out to be fairly superficial as I came to discover some major storyboard issues with the game. In an effort to integrate its story into your daily routine Exfiltration.ipa breaks its dialogue options into chunks, revealing them slowly over real time. The problem is that the game doesn’t fill the gap of these dialogue trees very well, often leaving you confused during and after a string of conversation. For all its faults Lifeline did this very well where the character Taylor would announce things like, “I’m heading for that mountain, I’ll message you when I get there.” The time it would take for her to arrive wasn’t clear but at least you had a sense of what the next story beat would be. Exfiltration.ipa does a poor job giving you those cues to let you know that it would be taking a break and I was often unsure of what was to happen next after I ran out of dialogue options. The designers of the game seemed to recognize that shortcoming by trying to fill gaps of time with spam messages. You get a lot of spam in your fake inbox which isn’t the sort of realism I’m particularly interested in. The spam really only served to annoy as it always teased me into thinking the next story interaction had arrived. Yay more story! Nope, just kidding. Further, I was repeatedly asked by my hacker handlers about the success of missions while the missions were ongoing and often none of my available responses made sense. Nor could I ever initiate a conversation with them outside of those demanding texts which was completely incongruous with the interface. When I finished a mission I had to wait for them to contact me first. Where things completely broke for me was that your missions not-so-apparently have fail states, and if you do fail to select the correct path to success, the app resets you to a prior story point without notice. 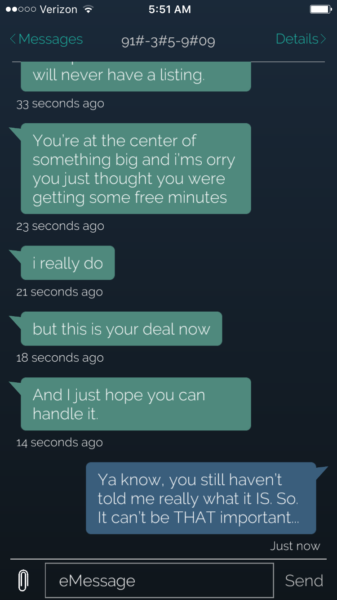 One of the missions had me trying to blackmail a hostile character and things went awry. I wasn’t sure what had gone wrong but wasn’t immediately concerned as again, as mentioned above, the game often goes silent at weird times. I was left assuming I’d get a another set of choices in an hour or so of real world time. I checked the game later after I hadn’t gotten any notifications in a long while and discovered that everything had reset to an earlier point in the story when that mission first began. Apparently I did the mission incorrectly. I am now full of remorse. I tend to write these posts over a span of weeks, on my commute, since that’s pretty much the only place where I have both some time to myself and the brain power to string sentences together. That gives me plenty of time to feel a full range of emotions. I feel terrible about all my complaining above since I can’t imagine how much work it took to get Exfiltration.ipa approved by the multiple major studios attached to the project. You want to promote our hit TV show with INTERACTIVE FICTION?!? I can’t help but feel, however, that the developers of Exfiltration.ipa ignored some major issues with the design of their game for the sake of their concept. It seems that they had to make some compromises, and overall the game appears to have needed significantly more user testing to better balance the timing of its conversations. That conversations in Exfiltration.ipa can be failed and that you’re sent back in time without notice is completely inexcusable. Again, I feel bad for not liking Mr. Robot:1.51exfiltrati0n.ipa since the concept is what I’d like to see more of, and its presentation is fairly polished, but this game is not a good piece of interactive fiction.